Remember how TVs went from square shaped to rectangular several years ago? That’s aspect ratio in a nutshell. Square displays use a ratio of 4:3 – meaning they are almost square but slightly wider than they are high. The new widescreen TVs are typically 16:9 meaning they are just that – widescreen. Computer monitors follow the same aspect ratios and since most displays being sold are widescreen, Microsoft has made it easy to configure the aspect ratio in your PowerPoint presentations. The problem comes in when you have an older presentation that was created in the 4:3 ratio and you want to copy a slide over to a new 16:9 presentation. The text is copied over correctly but the image may be stretched to fit in the widescreen area. Below are some tips for ensuring you maintain image quality when copying between presentations. You can maintain proper aspect ratio by using copy and paste within PowerPoint. 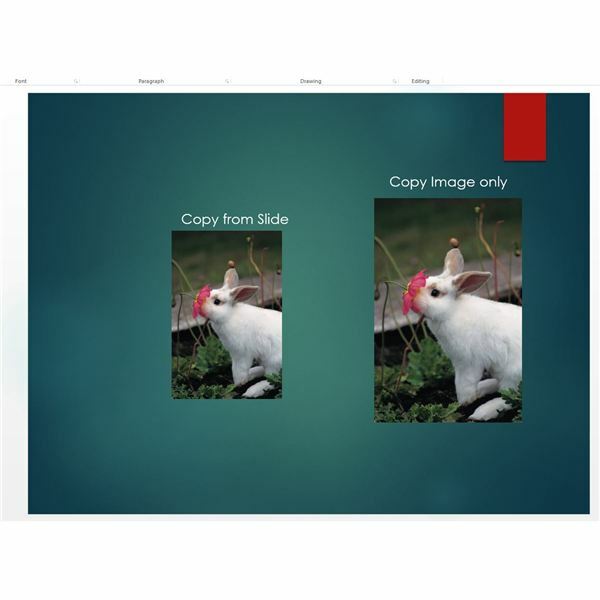 Right click on your image, copy, and paste it into your presentation. It will retain the aspect ratio of the original image. If you copy the entire slide and paste it into your other presentation the images may be distorted. As an example take a look at Figure 1. The image on the left was copied along with my original slide. The image on the right was copied by itself and copied into the new presentation. As you can see, the image on the right is larger and by examining the properties for the image it was not scaled while the left image was. If you have a lot of content to move over you may want to copy entire slides so you get all of the text copied over and then copy images separately. Even if you choose to copy over the image there is an easy way to fix them. To fix an image that was stretched or resized when you copied it, you can right click on the image and select Format Picture. On the right side of PowerPoint you will want to click on the Size and Properties button. A few buttons here will be of interest: Lock aspect ratio, Scale Height and Scale Width. As we can see in Figure 2 our image wasn’t stretched since the Lock Aspect ratio button is checked. This button ensures that any stretching or shrinking of the image was done proportional to itself. In this case, it was simply shrunk down by 25% for both height and width. We can fix this one of two ways. First we can click the Reset button. This will reset the picture to the original size that it was in the first presentation. The other way to fix the image is to set the Scale Height and Width to 100%. If you find that images keep losing their aspect ratio when you are copying them between presentations be sure to check the Lock Aspect Ratio property. I hope these few tips make your life easier as you start converting your content over from 4:3 to 16:9 aspect ratio. It may be a lot of work, but by moving to a 16:9 ratio you’ll have a lot more space to work with in your presentations.